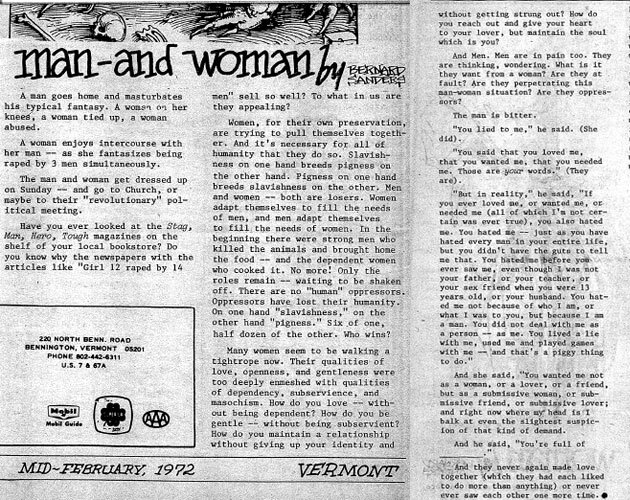 The typical sexual fantasy for women is to be violently gang-raped, according to a most-unusual essay 2nd-place Democratic presidential contender Bernie Sanders wrote in 1972. The essay, titled “Man – And Woman,” was discovered by the progressive magazine Mother Jones, which on Tuesday published a story on Sanders’ early years. The story itself makes no mention of the essay, but it appears in a picture accompanying it. The point of the essay appears to have been to call for a sexual revolution to eliminate the disparate power dynamics of human sexuality: “Slavishness” for women and “pigness” for men. Greater equality for the sexes, Sanders thought, would eliminate their depraved fetishes. The essay also includes an apparently fictional conversation between a man and woman which is similarly strange, apparently reflecting the hatred between the sexes engendered by the old sexual order. Sanders identifies as a socialist to this day, and his willingness to express unique views hasn’t changed. Back then, he was pushing for wider freeway ramps to making hitchhiking easier, and today he is advocating the return of 90 percent income tax rates. Some of those views are winning over Democrats dissatisfied with Hillary Clinton. A poll released on Thursday by Quinnipiac shows him polling second among Democratic primary voters, with 15 percent support.